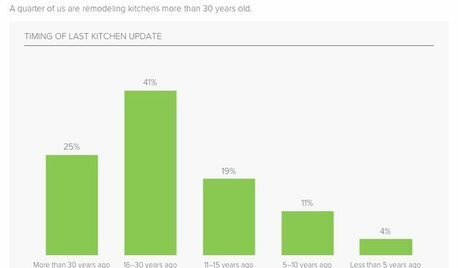 POLL: What will be the kitchen trends in 2016? 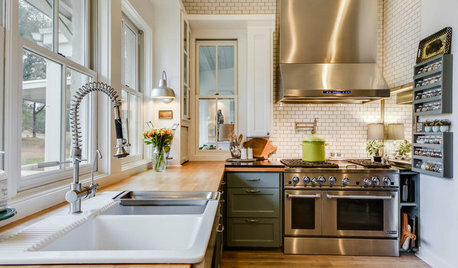 If you browse the kitchen photos on Houzz, you find so many cool features. 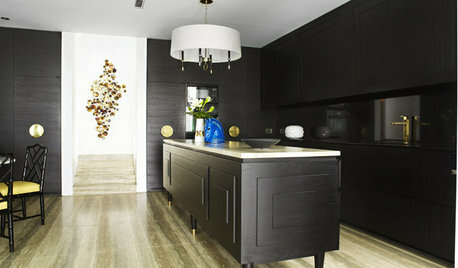 Clever storage solutions are popular, as is pendant lighting! But which features will trend next year, what will we see more and more of? Do you want to give it a go and predict what we'll be talking about in our 2016 roundup? Something else - tell us! I had a pantry built in to the corner of my kitchen and its the best thing I did. 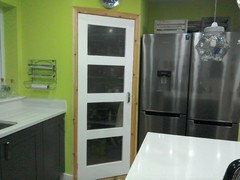 The door is glazed and frosted and the frame painted to match my units. The interior light comes on automatically when I open the door. 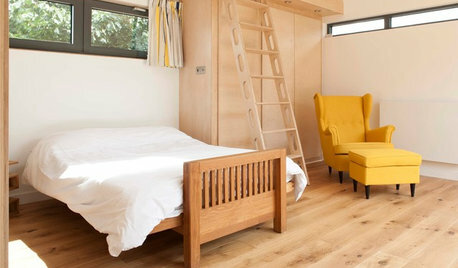 The floor to ceiling storage with wheeled bins on the floor is wonderful. Everything is easy to find. I feel pleased every time I go in there. would love to see a picture. . .
Me too as thinking about doing the same and trying to convince my husband! I'll add my voice to requesting a photo! OK I have to confess that I have not painted the door yet. You may be able to spot the colour patch tests on the inside of the door. It holds a lot of stuff for its size and its really handy by the island. We're a bit chaotic here today I'm making Roman Blinds for the sitting room and we have visitors tomorrow. Thanks for your interest. I kept my pantry when we renovated our house 15 years ago, it had the old slab and a drop down to it but we filled the hole and removed the slab, this took away a little space but made it feel part of the kitchen made a new door painted it dark blue and voila it has been useful ever since. Although ready for a little decoration now. Sorry seem to have repeated myself ! By the way I think trends for 2016 will be more natural with a Scandinavian feel. If I had a good sized kitchen I would have a central island with all the walls free a bit like a central shop counter with space on the middle !! We are currently doing drawings for an extension. The ground floor extension will be the kitchen diner with lounge seating at the end. 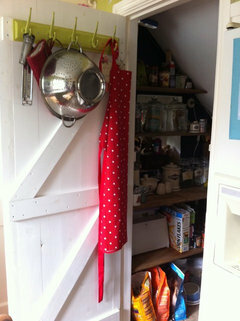 I have included a walk in pantry as this will allow me to keep kitchen surfaces free and I will not need wall cupboards. 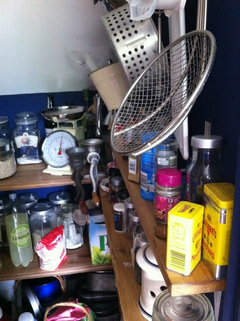 I am 6ft tall and have always felt wall cupboards to be a hindrance and in my last house chose not to have any. I think it makes the kitchen look more attractive. 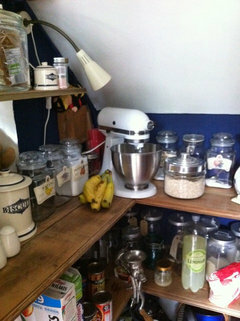 I have also lived in a house with a small walk in pantry, it makes life in the kitchen a lot easier. But it has to be located in the right place. 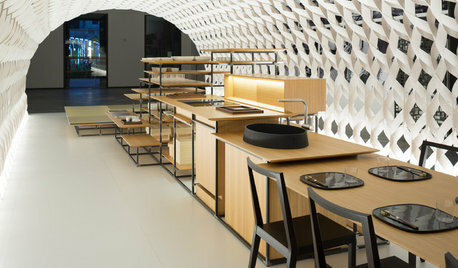 I'm so pleased to see the pantry coming back into vogue - it's such a great way to store food items. Lower shelves can be used for the bargain bulk buys we all want but often don't know where to put such as trays of beer and large packs of loo rolls; then high shelves are ideal for jams and preserves. 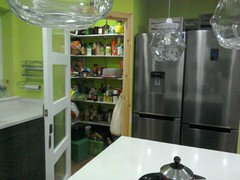 In the middle you can have everything handy from tinned goods to fresh produce, eggs and home-made cakes. Keep it cool with good vermin proof ventilation and if you decide to install underfloor heating retrospectively make sure to avoid the pantry! The trend to make the kitchen the place to socialise and cook will continue so the pantry plays an important role in the floor plan as does a separate utility room/laundry facility. The kitchen is more and more part of the living space; not just for cooking it's an area for eating, entertaining, craftwork and homework. So it needs to look more like a living room and be integrated into the design of that space rather than a separate area. 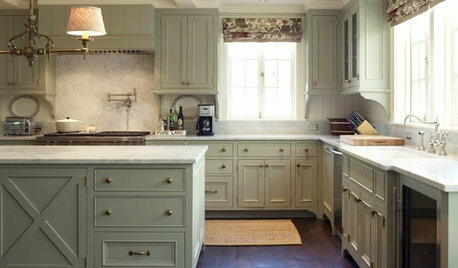 I want to see kitchen units raised in status and treated more like pieces of furniture! 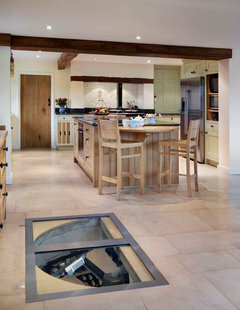 As a kitchen designer myself I'm hoping more people be more adventurous with their kitchen. It's one of the most important rooms in the house so why play safe? Create interest and a talking point. 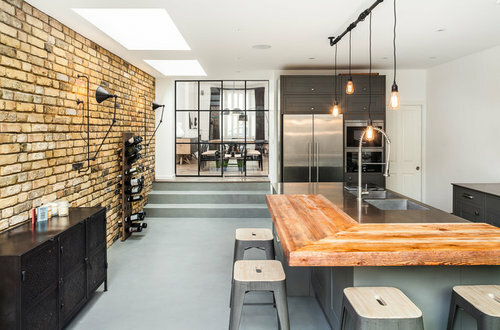 I think the industrial style is still going to be big, copper tones, greys, dark woods, bare brick, Teal. Ovens which are also steamer ovens. Christoff by Alana Creations Ltd. I think matt finishes have been here for some time.. deVOL and Plain English.. but I'd like to see more interesting ideas for cabinet fronts.. Handles carved into wood forming a design in themselves that's equally design as well as function... I find I don't like a lot of kitchens I see.. I hate islands and bar stools.. I'd like to see them as more interesting linear cooking areas with less obtrusive overhead extraction or sleeker, silent options that are hidden... Who want's a funnel over their hob! Dualit to provide a full copper toaster and a kettle that matches- they have never got the kettle quite right... I love the chrome toaster .. It's a thing of beauty! Copphrome is just a tease! Apps would certainly be my choice. "Christoff by Alana Creations Ltd.
Matt finish in preference to High Gloss finish on handle less kitchen"
And this is what we have just gone with. A Pronorm, handle less, matt grey/rift oak kitchen. Smart technology, using your iPhone to prepare your morning coffee! There's a boiling water tap in the canteen at work... addictively convenient! Boiling water tap in a family kitchen ? Doesn't anyone have children or failing elders around ? Very dangerous. Boil the kettle in a safe place. I'm going off trend and predicting the end of massive open plan boxes. They look great in photographs, but most people are not immaculately tidy, need some privacy, and like to get warm and cosy after a long hard day. Alot of people have pets and don't want them all over the work tops or white floor tiles. Not everyone can afford to heat a large area all day either. making a cup of tea will never be easier. I would like to put out a plea to kitchen appliance designers - keep operation simple. What's wrong with a knob to turn an oven on. We've just taken delivery of a new AEG oven and its sooooo complicated to get the oven to work. I have to spend ages toggling through all the functions until I find the one I want. I'm struggling to use the timer too so I'm going to have to go out an buy one of the old fashioned wind up ones! The idea of apps to manage my cooking is my idea of a nightmare. I want a kitchen where friends and relatives feel at home and don't need a degree in computer programming just to turn on the oven if they are trying to help. Pantry every time for me. We are looking forward to specifying natural materials like woods, marble and metallics to give warmth and texture. A pantry would be our choice, most of our clients are currently specifying these. boiling water tap is the way forward - instant cup of tea!! Hopefully old-school pantry - I think it'd be nice to keep kitchens the heart of the home without (too many) gadgets... More food, less technology! Hidden kitchens behind big, smooth sliding doors. Pantries are making a serious come back and they are so versatile adding huge amounts of value to the kitchen space as you are able to store everything together, out of the way saving a bit of kitchen cupboard space. Also the best ones are solidly made, cold and dark to help keep food fresh; solid walls (and thick) are a must unless you use special insulation. 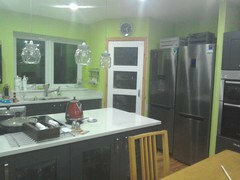 Voting for the wine fridge - but have to give a shout out to the beautiful kitchen wine cellar, two in one! It's going to be all about the Smart Technology! Smart technology is becoming a key area to incorporate in all design schemes, not just for the luxury market. make cooking, entertaining and living easier and more enjoyable has been the strongest trend with our designers and clients :). Instant Hot Water taps would be our choice! Hot water taps for us too! We've seen an increase in customers interest in the Quooker boiling water taps this year for sure! For those worried about having children around the house, Quooker have a childproof push-and-turn handle and the water is dispensed in a fine spray to prevent burns. POLL: 4 Hot Color Trends! Which is your favorite? POLL: What furniture\design trends inspire you? What's your design trend prediction for 2016? WHAT’S TRENDING IN KITCHEN SINKS AND FIXTURES?